Original Pen & Ink Drawing By Bert Hopping Verso Pencil From A Sitting By Harry Lauder Drawn From Life Dated 5 14 26? Pencil Drawing Harry Lauder From A Dressing Room Sketch1941? Sir Harry Self Drawn Signed Caricature On Photo 1927? Empire Theatre Helston Huntingtower March 1929? Lyrics Hey & Donal Weddin O Sandy McNab Handwritten By Sir Harry 1908? Palace Theatre Poster Blackpool Oct 8 19?? Sir Harry With King George VI & Maggie Teyte 1935? Boston Opera House Program Bi-Fold Nov 15 19?? Boston Opera House Program Bi-Fold Oct 9 1922? 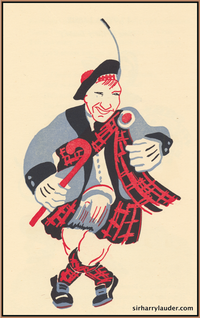 Flyer Harry Lauder 6th American Tour 1914? Fuller Opera House Madison Wisconsin Programme Single Sheet 1916? Kansas Memorial Theatre Emporia Programme Bi-Fold Jan 11 1922? Laminated Flyer For Seventh Annual Tour Berchel Theatre Des Moines Oct 19?? Lyceum Theatre Minneapolis Programme Bi-Fold Feb 21 1923? Manhattan Opera House Advertising Card Feb 18 19?? Murat Theatre Program Indianapolis Single Sheet Feb 8 1919 or 1930? Opera House San Bernandino Calif Unknown Newspaper Caricature Nov 17 1923? Rialto Theatre Utica NY Bi-fold Huntingtower Oct 1926? Salt Lake Theatre Programme Bi-Fold Jan 26 1923? Shubert Majestic Providence RI Programme Bi-Fold March 13 1922? Spreckels Theatre San Diego Programme Bi-Fold Nov 12 & 13 19?? Sir Harry & Scottish Horse Field Ambulance Dated 3 Apr 1915?